This sorbet is quick and simple. The crushed blackberries on the top lend a tart finish that is most satisfying. Slice the nectarines in half, remove the stone and chop into one-inch pieces. Place in a blender with the sugar and lemon juice. Purée until smooth; it will have little specks of skin throughout, which is very pretty. Place in an ice-cream maker and follow the manufacturer’s instructions. If you don’t own an ice-cream maker, freeze the mix in a low-sided container for two hours. Then remove and drag it with a fork, working from the outside in. Replace in the freezer. Repeat this every half hour three or four times, until all the mixture is formed of ice crystals. This makes a granita; its texture is slightly chewy, but it is just as delicious as any ice-cream. Place the blackberries in a bowl with the icing sugar. Using the back of a fork, crush roughly; it should have a slightly coarse consistency. Stir in the orange zest and chill. To serve, spoon into chilled glasses and top with the blackberries. 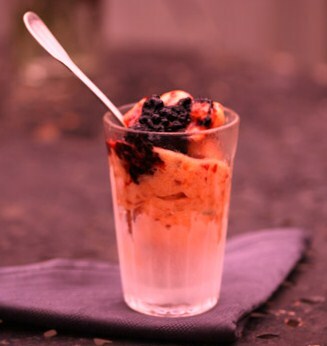 This entry was posted on April 15, 2011 at 10:11 pm and is filed under Food with tags blackberries, caster sugar, chilled, feeze, granita, ice-cream maker, icing sugar, lemon juice, nectarine, orange zest, recipe, sorbet. You can follow any responses to this entry through the RSS 2.0 feed. You can leave a response, or trackback from your own site.